This type of frameless shower door goes by several different names you may have heard while working on your bathroom project. Sometimes called an inline shower door or a swinging door with an inline panel, the names can be confusing! But we’re here to cut through the clutter. What is a Door & Panel Shower Door? - It’s actually pretty simple. 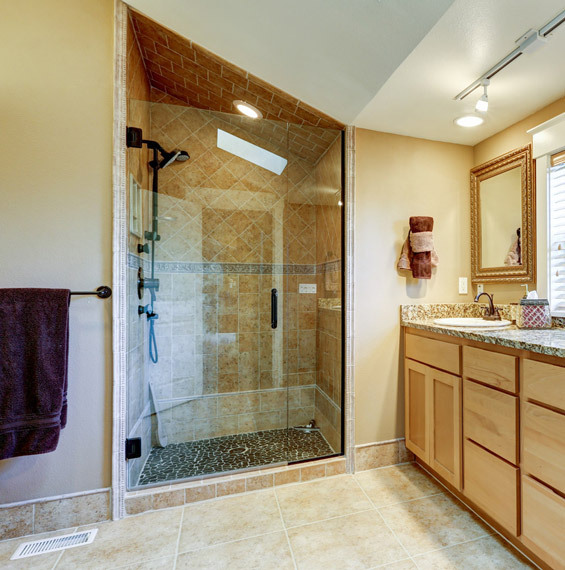 This kind of shower door (also known as an inline shower door) consists of a single swinging shower door and an extra glass shower door panel (or sometimes two panels) required because the shower opening is wider than building codes allow for just a single door. Flexible Configurations for Unique Spaces - We’ve been installing shower doors in the metropolitan Washington, DC area for more than 40 years. So we know a thing (or two) about the unique architectural properties of our region’s homes. Your home might be a federal row home in downtown Fairfax, VA or a more traditional colonial style home in Loudon County; new construction or a contemporary home in Northern Virginia. Door & Panel shower door configurations consist of between 1 and 3 glass panels, including the swinging glass panel for the door, so no matter what kind of space you have, we’ll be able to help you get the right frameless shower look. We offer a full enclosure, or transom at the top of your shower that can be opened to allow steam to escape, or closed, to keep the steam in. Doors can open to the left or right, and will be attached to either another glass panel or a wall. 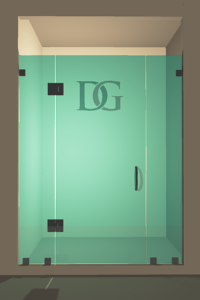 Why Choose a Dulles Glass Shower? 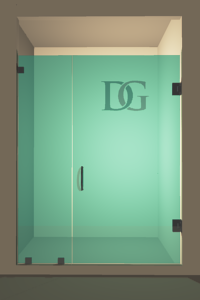 Durable, High-Quality Products - Our showers are made of the highest-quality heavy shower glass in either either 3/8" or 1/2", both of which offer superior structural integrity for your shower enclosure. Safe and Hygienic - Frameless showers are durable and constructed with the best quality hardware. In addition, they're easy to clean, because of the lack of a frame to collect dirt and moisture. Fully Customizable - You can customize your shower just how you want it: thickness of glass; glass tints and types; hardware finishes, and glass surface protection. Limit one per customer. Not to be combined with any other offers. Washington, DC metropolitan area only. The swinging door portion of a door & panel shower door will be between 22” and 36” wide. 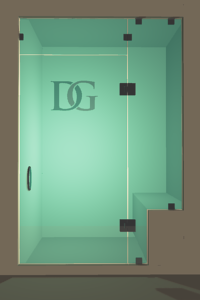 After 36”, the shower enclosure space will require an additional panel to make up for any distance beyond 36”. Additionally, the extra panel should be greater than (or equal to) 4 ½” wide. Sound a little complicated? No worries! As long as you know the width of your shower opening, a glass shower door expert will be able to figure out the right width for your door & panel shower door configuration. How tall your shower is will depend on several different factors. The height of a door & panel shower door affects the total weight of your shower, which we have to consider during installation. 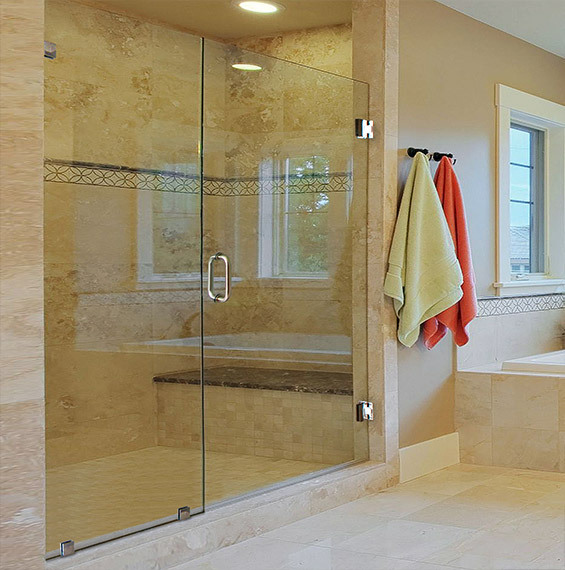 If your door & panel system is too heavy, performance of your new shower could be impacted. 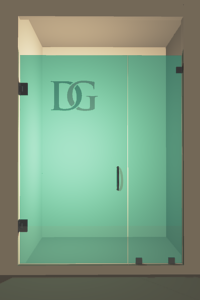 96” is the the maximum height for door & panel shower doors. A standard height for your door & panel shower door system is more likely to be 72” high. Door & Panel shower doors are very flexible because of their inline design. Many door & panel shower doors feature what you may have heard called one of the following: cutouts, notches, nibs, half walls, or knee walls. A common door & panel shower door configuration features knee walls on both sides. What other elements in your bathroom will dictate whether your door & panel shower needs knee walls on both sides. Sometimes it is a design element, but other times it’s required -- for example, if you have a bathtub on one side and your toilet on the other, you might want half walls on both sides. This is something you’ll decide with your contractor, but we’re happy to help you find the right door & panel shower door configuration at any time along your journey. You’ll also need to consider which way your door opens: to the left or right. Your shower door will always open outward, not inward, due to building codes. That means you will need to be cogent of any obstacles that would get in the way of your door and panel shower door. When choosing the right configuration for a door & panel shower door, you’ll have to consider whether the swinging door attaches to the wall (generally preferred) or to the extra panel of glass. We generally recommend installing the swinging door on the wall, attached to studs, if possible; however, there are times where a glass-to-glass installation may be necessary. 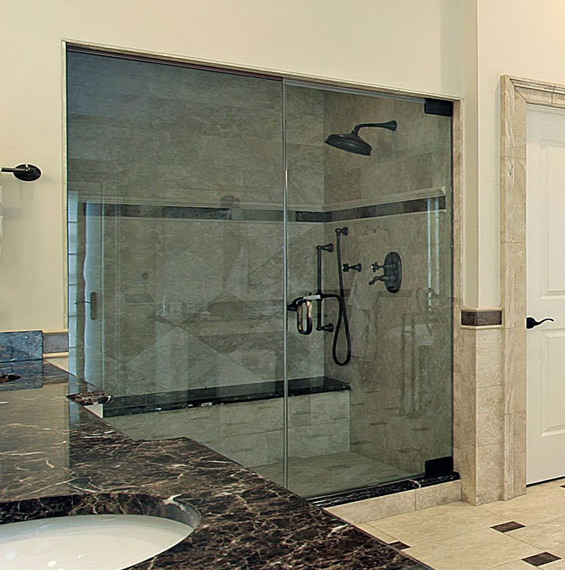 A glass expert will help you choose the perfect configuration for your door & panel shower door. We’ll be able to install your sparkling new door & panel shower door once you or your contractor have laid all the bathroom tiles. We’ll come to your home for detailed measurements before fabricating your door & panel shower door. Once fabricated, we’ll make an appointment to come back and install it. Voila! A new door & panel shower door that perfectly fits into your space. You can customize everything from the thickness of your tempered glass, the glass type, the hardware finishes, and even protective coatings like ClearShield that make your shower easier to clean.